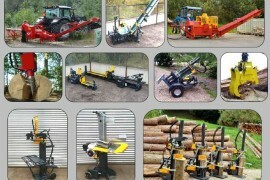 All the firewood machinery you will ever need, commercial & domestic, from one supplier with nationwide depots. Static, yard tow and even fully legal road tow. Powered by electric motors, petrol engines, hydraulics and tractor pto or hydraulics. Log saws, billets saws and band saws. 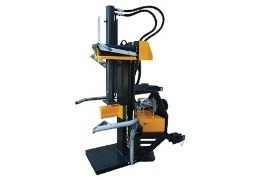 All types of log splitters, vertical, horizontal and cone splitters. Firewood processors. 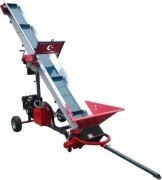 Firewood conveyors and log cleaners. We can even build special firewood machinery to ensure it works with the timber you have to handle, however hard, knotty or twisted it may be. 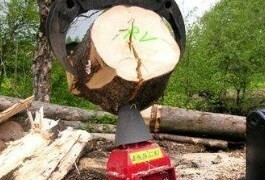 Riko have everything you need for domestic and commercial woodfuel production. Miss out the middle man, save time and money! If you are already using wood fuel then hopefully you already know the following. If you are considering burning wood fuel then read on to see why. * taken from the Forestry Commissions publication ‘Woodfuel meets the challenge’. Written, co-ordinated and produced by Forest Research, Forestry Commission England / Wales / Scotland and DEFRA. Vertical Logs Splitters are usually used for when you can lift the log by hand and put it on the splitter table. Some of our vertical Log Splitters have an adjustable table height that can also be removed so you can put a tall log up to 100cm high upright. If it is big diameter the 12-14-18-25 ton models can have a lifting arm to stand the log up. Horizontal Log Splitters are mainly designed for what we call ‘Billeting’, IE take a 100cm log and split it into long ‘Billets’ that you then ‘season’ (dry). When the Billet is seasoned you can cut them to the Log length you want. 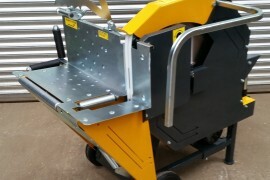 Hopefully, with one of our Saw Benches, or Saws and Conveyors. 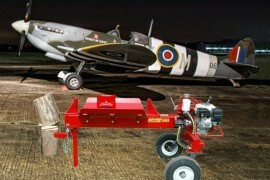 Horizontal Log Splitters can be specially ordered to take a log length the customer wants. For example the A22OR could be with a 2 or 2.5 meter log length. Again the Billet can then be cut to Log length on a Saw. Using this method you can also take large diameter timber and make it into Billets for a Firewood Processor. 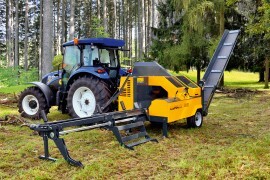 For example if the Firewood Processor takes a maximum diameter of 30cm Timber you can use something like an 30 Ton Horizontal Log Splitter with 2 meter Log length to make four 2 meter long Billets that can then be put through the 30cm Firewood Processor. Is it for commercial or private use? What timber, i.e. hardwood or softwood? What length do you usually cut your logs to? Are you interested in Electric, petrol engine, Tractor powered by PTO or tractor powered by the tractor hydraulics? If it is a tractor one what model & horse power is it? If it is electric do you have single phase or 3 phase electric at the place it is being used. 8 ton = maximum diameter of 20cm. If the timber is very bad with lots of knots and twists or is ‘Seasoned’ then you will need more power for the diameter. Especially if it is Seasoned Hard wood such as Oak, as this becomes very hard to split. The 4 way is for splitting one Log / piece of timber into four equal Logs. The timber should be straight grained and not all twisted. So if the 4 way knife is for a 12 ton machine then the maximum diameter is 30cm, you should not put a larger diameter Log / piece of timber in and split off two small bits and 2 big bits as it might jam and damage the log splitter.